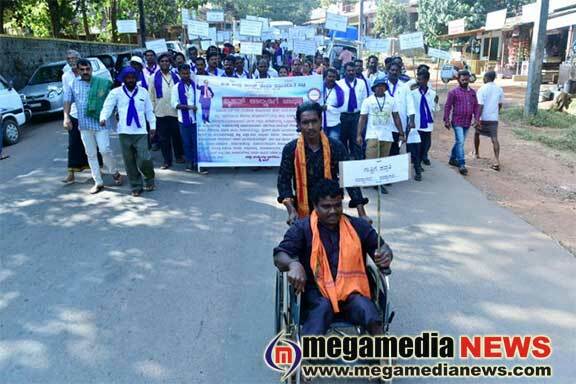 Mangaluru : Members of Zilla Dalit Seva Samithi took out a 42-km rally from Vittal to Mangaluru on Monday, urging the government to implement their demands. The jatha was flagged off by district president of the Samithi B K Sesappa Bedrakadu. He also urged the government to regularise services of SC/ST employees who are working in government departments on contract basis. “An Ambedkar Bhavana should be constructed in Sullia, Puttur and Vittal. The scholarship amount for the students from SC/ST communities should be increased. The district administration should take repossession of the DC manna land, encroached by many, and should be distributed among the poor,” said the president. The committee members submitted a memorandum to the deputy commissioner and the Zilla Panchayat chief executive officer.